Whoa! It’s almost April and I haven’t written in since late February. Time sure does fly when you haven’t filed your taxes! This spring has been exceptionally mild. We’ve had several days in the 60s and 70s, with ample sunshine. It’s gotten to the point where if it rains for more than a day I catch myself thinking “What’s with this crazy weather? !” which of course, up here in Washington state is downright silly. I really feel for my family back east who are suffering from such a miserable, protracted winter. I also ache for my family and friends in California who are in the midst of a horrible drought. I’m sure we’ll be paying for this wonderful weather in one form or another, but at the moment all I can do is be grateful. Obviously a lot has happened in the past couple months, including the official switch from growing vegetables alongside meat, to focusing solely on ethically raised meat and eggs. In order to help spread the word and grow our business, I spent a good chunk of time building a new website for our farm. Please check it out and let me know what you think (and consider supporting us by purchasing our meat if you’re local)! 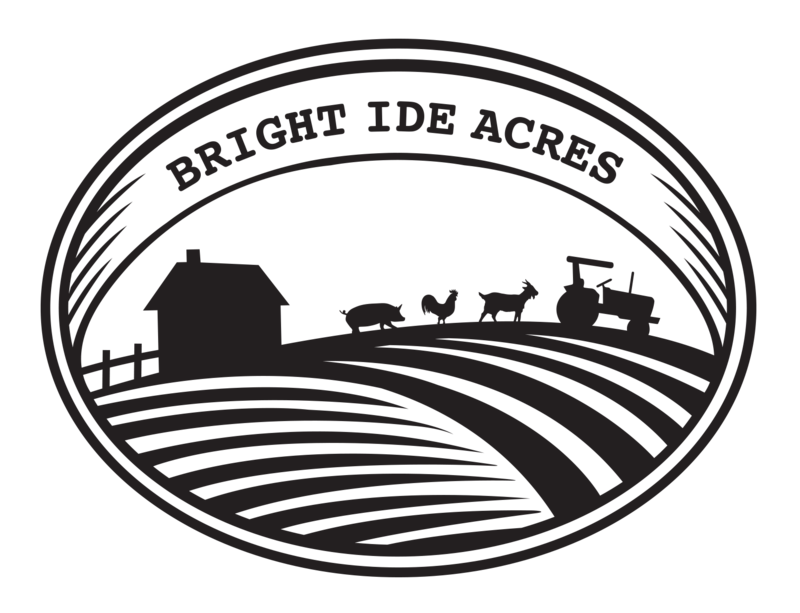 Link: www.brightide acres.com. This switch has been challenging in several ways. First and foremost is the loss of early season capital. With our vegetable CSA, much of the money for the produce was collected before the season even began, which gave us a good amount of money we could then use to buy our baby chicks, pigs, feed, and other supplies. This year of course we don’t have that capital, and we’re also doubling and tripling our animal numbers so it’s a bit of a dilemma. We are working on some alternative loan options, so if anyone out there in the world reading this wants to help a small farm get a foothold, I’d love to hear from you! In the meantime Andrew and I have both been busy both on the farm and off. In order to make ends meet we’ve found a few part-time jobs can really help. I’m still washing dishes and doing some catering assistance for some pals who work at a winery, and have added a day of vegetable packing for another farm-fresh operation nearby. Andrew has started pouring concrete two days a week, which is a skill he has honed since high school. We consider ourselves fortunate that we found work easily and that we can be choosy about how we spend our time working for others; most people don’t have that luxury and for that we are grateful. One of our biggest areas of growth this year is in our pastured chicken husbandry. We are going from raising 600 broilers last year to 1,200 this year, and in order to do that we are hoping to utilize a new WSDA inspected mobile slaughter unit. This slaughter unit would come to the farm and slaughter, air-cool, and vacuum seal our birds. Since it is inspected by the state, we would then be free to freeze the birds and bring them to farmers’ markets, sell to restaurants, or any other way we see fit. This is only possible if electricity becomes a reality at the farm. Eric, the landowner, has been working on this for months, but of course government red tape is making progress slow. We have our fingers crossed, bound, and doubled over backwards for the approval, but only time well tell and we’re furiously working on a plan B just in case. Since we aren’t growing veggies this year, a lot of acreage that we were using is now available, and a new group of farmers has come in to lease the land. Rand and Alice are two very nice, intelligent, and experienced women farmers, and we’ve enjoyed getting to know them as they start working the soil. It’s truly impressive to watch farmers who were originally trained on bigger, more professional farms. Comparing their efficiency to how we scrambled around these last couple seasons has cemented my confidence in our decision. We certainly loved growing vegetables and we did pretty well for ourselves, but now that we’re on the other side looking back I can see we made the right choice for us. In a few days Rand and Alice’s interns start arriving, and I’m looking forward to meeting some more like-minded people and making new friendships. I guess I should mention the baby animals! We’ve had 28 baby goats born at the farm in the past month or so. We’ve also had 11 lambs born. Out of those 11 lambs, only two are female! That’s nice because the males will be raised for meat, although it makes growing our future flock more difficult. Either way at this point all I can say is baby animals are adorable, hilarious, and so much fun to be around. And really what more can you ask of life than to be nibbled on by such sweet little faces? We’re taking advantage of a warm sunny spring by eating outside as much as possible. This BBQ with friends was almost entirely homegrown meats. I made nettle pesto last week, and it was delicious! I have more nettles in the fridge waiting for their big moment. Caution: use gloves until the nettles have been blanched! When I do a restaurant shift I bring home leftovers for our spoiled chickens. Andrew built this amazing henhouse! Our 120 pullets have just started laying baby-sized eggs. The sleepy baby faceplant! Our first batch of Freedom Ranger broiler chickens is almost ready to go out on pasture. Love love love the new site!!! You guys are doing amazing work!! Spent some time on the new website, it is very well done! Love it. Lots of great pictures and information. I hope this new endeavor goes wonderfully for you and Andrew! Great website! Thanks for your email/newsletter. I look forward to reading them. Did you know we’re in Michigan now? Brian works for Cayman Chemical. We’re in a smallish town with farms around us. I want to raise chickens. I wish you were here. I’d be a big customer (you won’t believe how much our boys eat…especially Clay). I’m so happy for you.